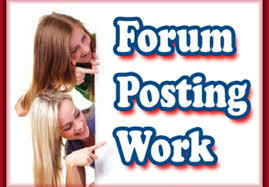 Forum Posting Services is one of the best SEO tactics to get TOP ranking in search engines. In this method we will write and post in different forums and will add your website or blog link with your keyword / anchor or raw URL respectively. ★★★ Forum Posting Service ★★★ 50 Unique Domains ★ 50 Quality Contextual Links ★ DA20+ ★ PA20+ is ranked 5 out of 5. Based on 7 user reviews.